BRISTOL - The programming committee for the planned Memorial Boulevard Intra-District Arts Magnet School has been meeting with the architect to get a preliminary idea of how the school will be laid out. The city and school board are collaborating on the project to transform the old Memorial Boulevard School into a arts magnet school for grades six through 12. The architect, Farmington-based Quisenberry Arcari Malik LLC, has estimated the new school could be open by August of 2022. The programming committee has previously decided the high school students who attend the arts magnet school will continue to get their core subjects at their regular high school, in a model similar to Bristol Technical Education Center. The committee is looking at having course pathways that would allow students to concentrate on studying creative construction; visual arts; musical arts; television video and theatrics; entertainment sports; events management; advertising, marketing, and communications; and “possibly a culinary and food service entrepreneurship” pathway, she said. Michael Dietter, school district director of special services, who also chairs the project’s building committee, said the architect has provided his committee with some exterior mockups and interior floor planning options. “I stress that all of these things that are being shared are very preliminary and are intended to create some conversation and feedback and input from the multiple individuals on both this committee as well as the programming committee,” he said. 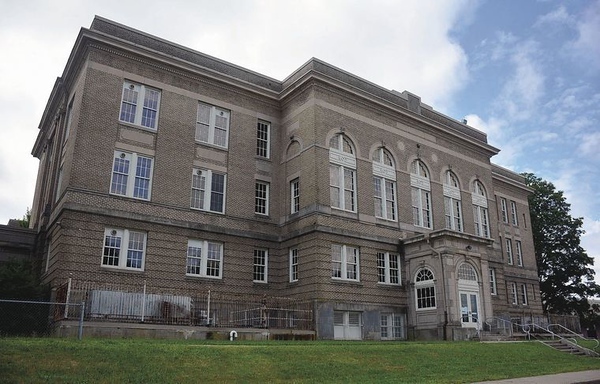 The building committee has previously chosen a joint venture between Downes Construction Co. and D’Amato Construction Co. to renovate the old school. Memorial Boulevard was the city’s high school when it opened in 1922. In 1967, it became a junior high school and then a middle school, until it closed at the end of the 2011-12 school year, as part of a major redistricting in which five aged schools were closed and two large new ones opened. Posted in The Bristol Press, Bristol on Sunday, 10 February 2019 20:21. Updated: Sunday, 10 February 2019 20:23.